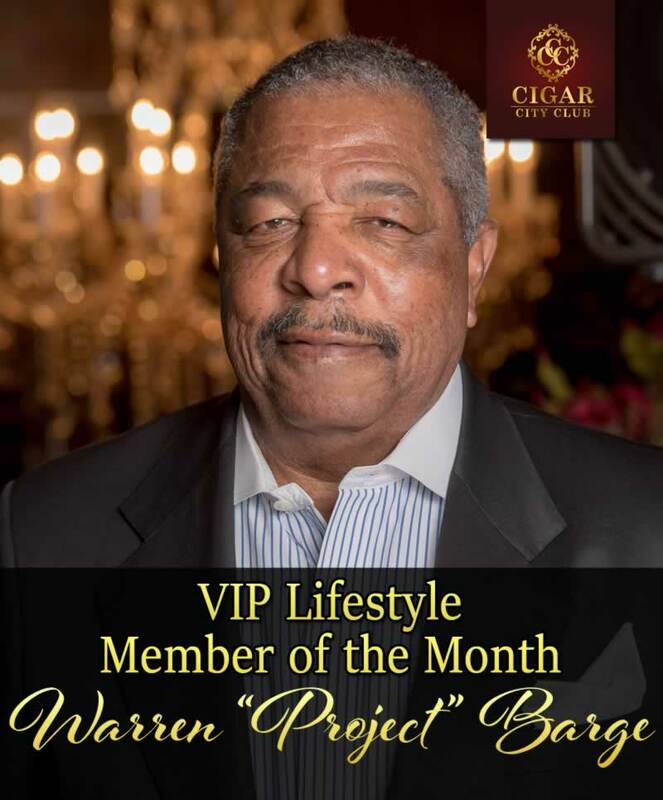 Warren “Project” Barge has a mutual respect for his friend and Cigar City Club (CCC) owner Julius Bolton who he first met at a venue of the same genre. He soon discovered they had many commonalities including sharing the same hometown of Selma, Alabama although a generation apart. Project recalls the time when Julius would casually mention that he was going to open a cigar spot of his own. Today he’s a proud supporter of CCC as a member and by introducing a myriad of famous and well respected pals and colleagues to the establishment in which he regards as mature place where you can smoke cigars and have a good time! Project is a familiar face in the club and is often called upon to share his life experiences and advice with other patrons. The nickname “Project” was coined during his freshman year in college when he signed up for his Senior Project course after discovering it was the last one needed to complete before graduation; this was also his way of getting ahead of the long registration lines he witnessed that day which seem to plague every student body. This bold and blazon move is one of many in which Project is known for that led to his successful retirement at the age of twenty-three thanks in part to his successful business venture as a supplier to General Motors (GM). He credits his parents for cultivating his experiences to travel and using education as a tool for advancement. As such, he was well positioned for GM when they recruited him as their highest exam scoring engineering student from Tennessee State University. While he had a bright future ahead with this automobile giant, Project resigned from his position after eighteen months when a Junior College graduate became his manager. With the support and advice of his acclaimed mentor, John DeLorean, Project forged ahead purchasing a company known for creating different forms of animal “piggy banks” for kids and transformed it into a manufacturer of automotive plastics. His company did very well supplying windshield washer bottles to his former employer. Following the path of his upbringing, Project has an affinity to pour his wisdom into the lives young people by exposing them to places and activities they may not have ever imagined. His parents gave him and his three siblings a head start to advanced levels of education and the ability to see the world as his mother was a school teacher/principle and father, a Navy man. Project lived on the campus of Indiana University every summer for four years as his mother worked towards her graduate degree. There he would attend school from 8-12 and during down time, learned how to pay golf and tennis which his mother viewed these individual sports as the games of the future. Project has a firm belief that “you can only perform to the level in which you are exposed.” He affords his mentees with the space to practice their golf game at the Golf Club of Georgia and by giving them career preparation advice. He often holds Q&A roundtable sessions for the youth and connects them with other influencers to help them along their journey. Project founded the annual Calvin Peete awards in honor of his longtime friend and the first black golfer to participate in the PGA tour that brings recognition and scholarships to the younger generations. With the passing of Calvin Peete in 2015, his legacy lives in his foundation that is preparing to hold its 7th anniversary of the awards, held the first week of October every year. Project also hopes to see his work to induct his friend in to the Golf Hall of Fame come to fruition. To learn more and/or become a sponsor of this great event, visit Calvin Peete Foundation or call 404-219-7448.